Glass plate negatives were invented in 1839 by the British astronomer John Herschel. The collodion wet plate glass negative came into widespread use from 1850 until well into the 1880s. Wet plates were characterized by thick, rough-edged glass unevenly coated with emulsion. The gelatin dry plate glass negative was introduced commercially in the 1860s. Dry plates used thinner glass evenly coated with emulsion. They were mass produced and widely used until the 1920s. Glass plate printing was an involved process that can be simplified by modern methods and materials. Printing pictures from glass negatives reveals a Victorian era world in sharp, fine detail. Use traditional dark room printing methods if you have access to a fully outfitted dark room. Make positive-register contact prints using the glass plates as if they were regular film negatives. Lay the plates on variable contrast photographic paper. Use an enlarger or other low-wattage light source to expose them. Examine the prints to pick the ones you want to print in a larger format. Use the contact print as your final photo when working with 5-by-7-inch or 8-by-10-inch plates. Put the plate in a negative carrier and use an enlarger to make your prints. Blow them up to 20-by-24 inches as the emulsion has no grain. Develop the pictures or contact a full-service photographic printing business for the job if you don't have the necessary equipment or skills. Scan the glass negatives for digital printing. Digitize the negative images with a flat-bed scanner, preferably one with a transparency adapter to back light the plates. Put down a clear sheet of acetate to protect the scanner's glass. Lay the plates emulsion-side down on the scanner after cleaning them with a soft brush. Clean the glass side with a mild solution of glass cleaner for a clear scan. Set the scanner to copy at its highest level of resolution and focus. 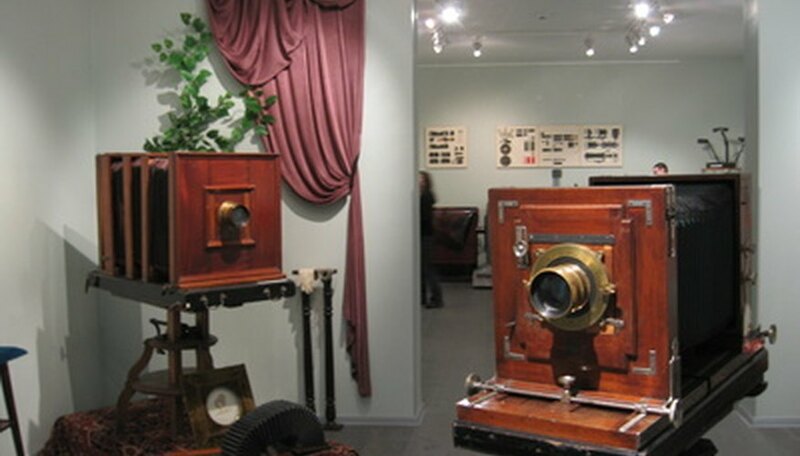 Photograph the glass negatives with a digital camera as another way to get the images onto your computer. Shoot the plates from the emulsion side for clarity. Back light the plates with a light box or have someone hold them up against a back-lit window. Transfer your images from the scanner or camera onto your computer hard drive. Manipulate the pictures in a photo or paint program to prepare them for digital printing. Reverse the negative image and crop it if the edges are rough. Use the program's tools to repair the effects of damaged plates. Clean up your images by removing cracks, stains and other imperfections. Adjust and tweak the images until they look just right. Use archival paper and inks to print the photographs. Don't stress, bend or drop glass plate negatives. They can break easily.